2 What body parts are usually affected? Hyperhidrosis is unusual and extreme sweating which is not associated with exercise or heat. A person sweats so much that it drenches through clothes and seeps through hands. Besides disturbing regular activities, excessive sweating can result in embarrassment and social anxiety. It is a common disorder and over 5% -10% of Americans suffers from it. What body parts are usually affected? Hyperhidrosis in sole and palm sweating begins around the age of 13 while underarm sweating starts after maturity. If the problem is left untreated, it can continue throughout the life. In severe cases, serious issues are seen like problem in holding a pen, shaking hands or gripping a steering wheel. It can also make it hard to lead a healthy life. It can affect a specific body part or the entire body. However, feet, palm, underarm and groin are the most common parts affected due to the maximum number of sweat glands. Plantar Hyperhidrosis: Impacts feet or soles, easy to hide with socks and shoes. It also makes it difficult condition by making feet slippery. Axillary Hyperhidrosis: Affects underarm area, it has the highest density of sweat glands, and people usually sweat heavily in this section after an extreme But patients with this disorder sweat naturally without any exercise and the sweat leaves a stain on the garment which results in self-consciousness and nervousness. 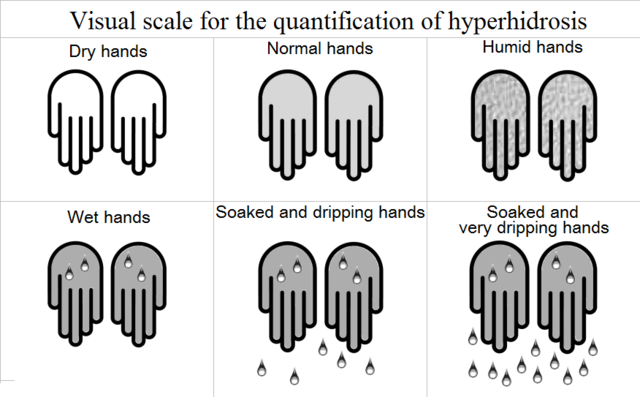 Facial Hyperhidrosis: Excessive sweat on face and head, it is the most embarrassing as it harms a person’s social life. Truncal Hyperhidrosis: Impacts the groin area, thigh region, and These regions are prone to fungal infections as they take a longer time to dry. Primary Idiopathic Hyperhidrosis: Condition when the reason of abnormal sweating is unknown. In most of the cases, hyperhidrosis is limited. Secondary Hyperhidrosis: Person sweats due to hidden health condition like gout, obesity, tumor, menopause, diabetes mellitus, mercury poisoning, hyperthyroidism, etc. Spending a substantial time managing sweat, like wiping, using napkins and pads below arms, wearing dark or heavy clothes, changing clothes, etc. 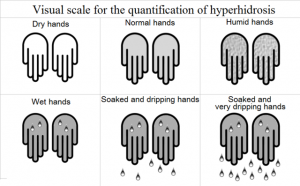 Genetics: Genetic tendency can lead to primary hyperhidrosis. Menopause: Women experience a different type of physical and emotional change which can lead to extreme sweating. Puberty: Adolescents steadily are exposed to stress and anxiety leading to severe sweating. Nerves and Brain Functions: Impaired neural brain response can provoke the sweat glands to react to body temperature wrongly. Obesity: Hyperhidrosis affects any body type, but overweight people are more prone to the disease as the sweat glands work twice to clean the toxins and also maintain the body temperature. Temperature: Sweat controls the body temperature when exposed to intense humidity and heat. The body requires cooling by excessive sweating to manage temperatures. Hence, people living in colder climate sweat more when they are exposed to high temperatures. Other disorders include different type of cancers, Hodgkin’s disease, frequent infections like HIV, tuberculosis and Parkinson’s disease. The doctor will examine for some underlying conditions first, like low blood sugar levels, or overactive thyroid through blood tests. Patients will be asked about the sweat pattern like body part affected, sweating episodes, whether they sweat during sleep, etc. Additionally, an expert might also ask a series of questions or ask to fill out a questionnaire to know the details. Thermoregulatory sweat test: Powder that is moisture sensitive is applied to the skin which changes its color due to excessive sweating. Patients are exposed to high temperature, and people with hyperhidrosis will excessively sweat on palms. It allows the doctors to know about the seriousness of the condition. It usually starts with the antiperspirants. Other therapies and medications are available if antiperspirants don’t work. In some severe cases, experts might suggest a surgery to separate the nerves liable for sweat overproduction or to remove sweat glands. Iontophoresis: Hands and feet are submersed in water to pass a comfortable electric current. Most patients require three to five 25-35 minute treatments. Botulinum toxin (Botox): These injections prevent the nerves that provoke sweat glands. Several injections are needed for positive results. ETS (Endoscopic thoracic sympathectomy): Recommended only in chronic cases, in which other treatments do not respond. It cuts the nerves that carry messages to the sweat glands. Used to treat face, armpits, and hands hyperhidrosis, but not for feet due to the risk of permanent sensual dysfunction. Microwave Destruction: Tool used to destroy sweat glands causing least damage to other tissues. Armpit Shields: Pads used to protect clothing from perspiration. Antiperspirants: These sprays include aluminum chloride which hinders the sweat glands. Clothing: Cotton or loose clothing can help, but synthetic fibers like nylon can deteriorate the situation. Shoes: Synthetic or plastic can make the condition worse, but natural materials like leather and rubber are recommended. Socks: Made up of cotton are best to absorb the moisture. Heat Rash: Itchy and a red skin rash that results in a prickling and stinging sensation. Heat rash appears when the sweat ducts get blocked, and sweat gets trapped under the skin. Bacterial Infections: Specifically around the hair follicles and within toes. Psychological Impact: Excessive sweating affects a person’s relationships, jobs, confidence level. Some people get depressed, socially withdrawn and stressed.